You can find most any car make and model in the metro NYC classifieds. It is very unusual to find more than one Opel for sale though. Opel is General Motors successful European affiliate that sold cars here in the late 1960's into the 70's. 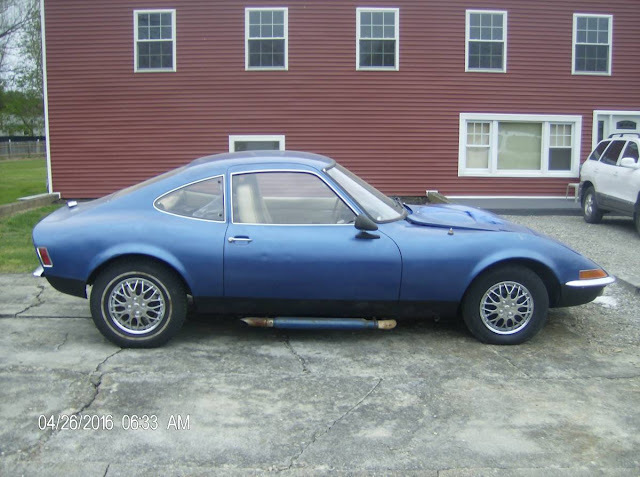 Today, we have to choice between these two tasty German morsels: a 1970 Opel GT in Poughkeepsie, NY for $3500 and a 1974 Opel 1900 in North Haven, CT for $6000. 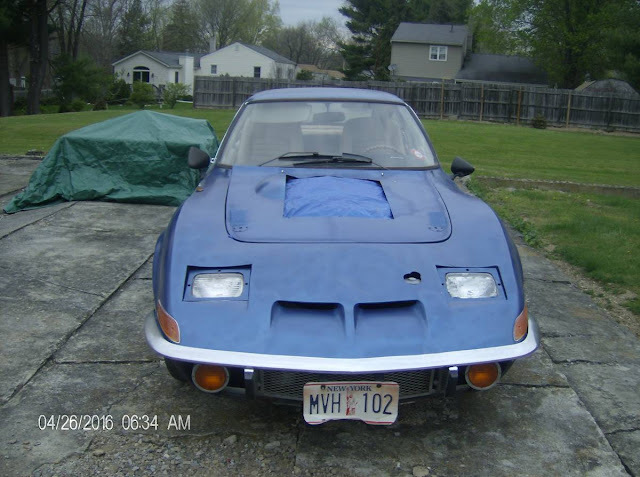 This Opel GT has had it's 1.9 OHV pushrod 4 cylinder engine swapped out for the venerable Ford 302 V8 which is mated to an auto transmission. The car is said to run and drive, but has been off the road since the late 90's. The flip up head lights have received some sort of crude surgery vaguely similar to what is sometimes found on first generation Miata units. The hood has also been modified to accommodate the larger engine and the not pictured air cleaner. 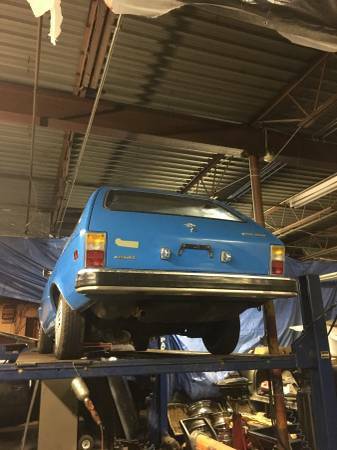 The seller mentions the undercarriage is solid and rust free. Additional side pipes complete the Corvette-esque side profile. The bare interior shown was temporary as the rugs have been since cleaned and reinstalled. This seller is open to trades. Our second Opel is a one owner car with 49,000 miles that has never seen rain or snow. 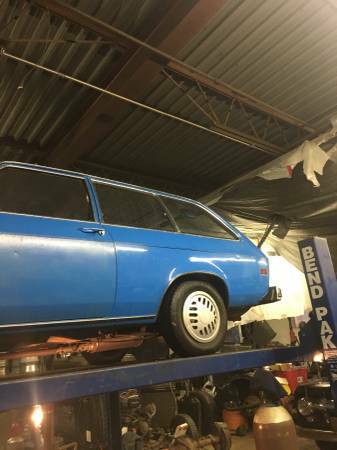 This two door wagon sports electric blue paint and funky period wheels. The 90 horsepower four cylinder engine is mated to automatic transmission and has the rare air conditioning option. The car is on a lift in all the pictures and is said to need a bit of tlc from sitting many years. Rust is limited to a small spot on the bottom of the passenger side fender and little surface areas on the unibody. The ad mentions the original owner (old man) putting duct tape on the fabric rip on the driver seat which bring up the question who exactly is selling the car and what is their relation to the old man. 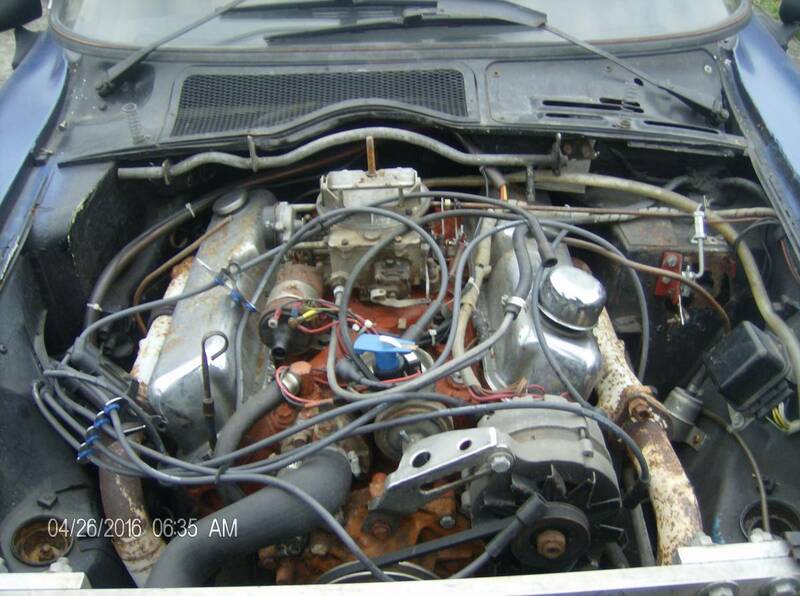 The UGLY exhaust manifold flip just like the pinto V-8 setup's i am sure it works fine just not eye candy to me. 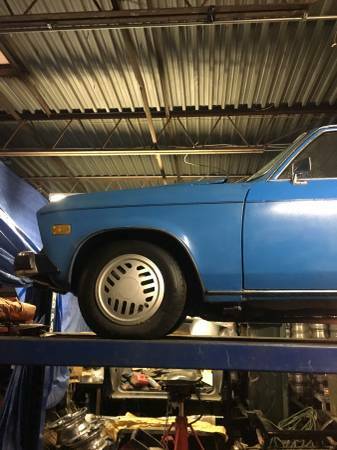 There was a guy local to me growing up who swapped a 350 SBC into a 'B' Kadett. He took it for a test drive and the doors would no longer open. By the way, I'm in no way saying that it was a bad idea. Just objectively stating that the structural integrity of the car was no longer sufficient for the vehicle's current state. I stand behind it being a good idea.